Emily is still looking for this lamb. I’m looking for a white lamb with a peach-coloured face, paws, and belly. 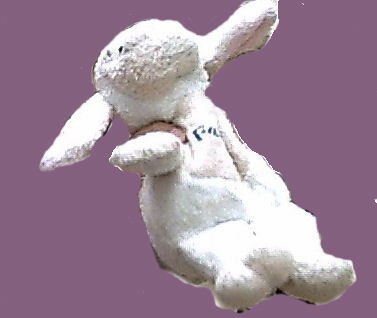 It was about 6″ tall and was in a “seated” position (as opposed to lying on it’s front); it had quite floppy ears for a lamb … and the most special part: the word “Faith” was embroidered on its belly in dark blue. (Faith is my daughter’s name.) It might have been a GANZ. My daughter, Faith, received this little stuffed lamb as a gift for Christmas 2005. She carried it everywhere and it was lost in June 2006 in the west end of Toronto. For the past year and a half, she has cried over her lost lamb-ee, and wished that it would come back. These past few weeks, as we approach the Christmas season, she has asked Santa and/or God to bring back her lamb. That is all she wants for Christmas. This lamb was purchased from R.G. Mitchell’s Family Books around the end of 2005. It might have been a special product for a fundraiser or something. Please let me know if you can help find Faith’s lamb (or one exactly like it) in time for Christmas! Could this be a ganz lamb? Similar but not it. Thank you! That is the closest I’ve seen. It must have been the same kind, a Ganz. Thanks for the lead! I will follow up. It’s a Beanie Baby, which means it has beans inside of it. What I can suggest is if you find a similar lamb, bring it to a seamstress or a store that does embroidery work (can google to find one) and have the name “Faith” embroidered on the new lamb. Then, if your daughter fusses that it’s not the original lamb-ee, tell her it’s a sister of the original Faith and its name is also Faith. It’s heard about her all year and was lonely and wanted to live with her, come Christmas time. It loves her very much and wants to stay, can it? This is exactly how I used to play it with my son in an impossible situation and IT WORKED! But you have to play it upbeat!